Aung San Suu Kyi is one of the first leaders to arrive for an ASEAN summit in the Philippines. The head of Myanmar’s government is under pressure over the exodus of Rohingya Muslims and all eyes will be on this 50th anniversary summit to see if the crisis will be addressed by leaders. President Trump is also attending ASEAN, which stands for the Association of South East Asian Nations, a bloc of 10 countries. With big demonstrations against Trump’s visit, security is tight with close to 60,000 soldiers and police on duty. Trump is heading to ASEAN on the last leg of his 12-day trip to Asia. Earlier, at an APEC summit in Vietnam, the US leader met the Philippine President Rodrigo Duterte for the first time. 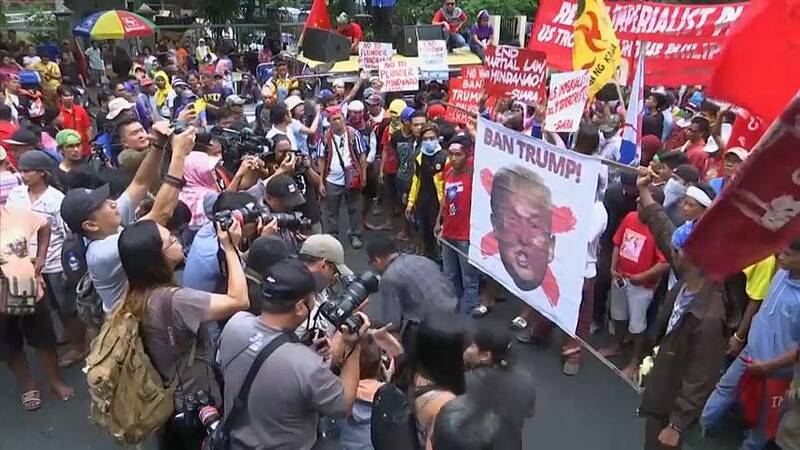 There had been suggestions in the media in September that Trump might skip the ASEAN meeting, but in the end it was confirmed by the White House. Duterte is a controversial figure on the world stage, accused of rights abuses in his relentless war on drugs. He denies the claims.